Laptops combine all the input/output components and capabilities of a desktop computer, including the display screen, small speakers, a keyboard, hard disk drive, optical disc drive, pointing devices (such as a touchpad or trackpad), a processor, and memory into a single unit. Most modern laptops feature integrated webcams and built-in microphones, while many also have touchscreens. Laptops can be powered either from an internal battery or by an external power supply from an AC adapter. Hardware specifications, such as the processor speed and memory capacity, significantly vary between different types, makes, models and price points. Design elements, form factor and construction can also vary significantly between models depending on intended use. 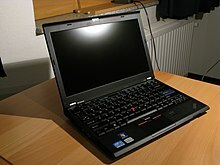 Examples of specialized models of laptops include rugged notebooks for use in construction or military applications, as well as low production cost laptops such as those from the One Laptop per Child (OLPC) organization, which incorporate features like solar charging and semi-flexible components not found on most laptop computers. Portable computers, which later developed into modern laptops, were originally considered to be a small niche market, mostly for specialized field applications, such as in the military, for accountants, or for traveling sales representatives. As the portable computers evolved into the modern laptop, they became widely used for a variety of purposes. As 8-bit CPU machines became widely accepted, the number of portables increased rapidly. The first laptop-sized notebook computer was the Epson HX-20, invented (patented) by Suwa Seikosha's Yukio Yokozawa in July 1980, introduced at the COMDEX computer show in Las Vegas by Japanese company Seiko Epson in 1981, and released in July 1982. It had an LCD screen, a rechargeable battery, and a calculator-size printer, in a 1.6 kg (3.5 lb) chassis, the size of an A4 notebook. It was described as a "laptop" and "notebook" computer in its patent. The Osborne 1, released in 1981, was a luggable computer that used the Zilog Z80 and weighed 24.5 pounds (11.1 kg). It had no battery, a 5 in (13 cm) cathode ray tube (CRT) screen, and dual 5.25 in (13.3 cm) single-density floppy drives. Both Tandy/RadioShack and Hewlett Packard (HP) also produced portable computers of varying designs during this period. The first laptops using the flip form factor appeared in the early 1980s. The Dulmont Magnum was released in Australia in 1981–82, but was not marketed internationally until 1984–85. The US$8,150 (US$21,160 today) GRiD Compass 1101, released in 1982, was used at NASA and by the military, among others. The Sharp PC-5000, Ampere and Gavilan SC released in 1983. The Gavilan SC was described as a "laptop" by its manufacturer, while the Ampere had a modern clamshell design. The Toshiba T1100 won acceptance not only among PC experts but the mass market as a way to have PC portability. 2-in-1s are designed to be used not only as a media consumption device, but also as valid desktop or laptop replacements, due to their ability to run desktop applications, such as Adobe Photoshop. It is possible to connect multiple peripheral devices, such as a mouse, keyboard and a number of external displays to a modern 2-in-1. 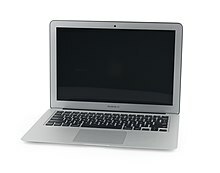 A desktop-replacement laptop is a class of large device which is not intended primarily for mobile use. These devices are bulkier and not as portable as other laptops, and are intended for use as compact and transportable alternatives to a desktop computer. Desktop replacements are larger and typically heavier than other classes of laptops. They are capable of containing more powerful components and have a 15-inch or larger display. Desktop replacement laptops' operation time on batteries is typically shorter than other laptops; in rare cases they have no battery at all. In the past, some laptops in this class used a limited range of desktop components to provide better performance for the same price at the expense of battery life, although this practice has largely died out. The names Media Center Laptops and Gaming Laptops are used to describe specialized notebook computers, often overlapping with the desktop replacement form factor. A business laptop is a laptop designed for those in a workplace. Typically, it is ruggedised, with consumer facing features, like high resolution sound, removed to allow the device to be used for pure productivity. It may sometimes include business oriented features like TPM, Fingerprint Scanner, Smart Card Reader and/or a Pointing stick. Internally, a display is an LCD panel which could be TFT backlit or LED backlit which talks to the laptop using the LVDS protocol, while externally, it can be a glossy screen or a matte screen. Most modern laptops feature a 13 inches (33 cm) or larger color active matrix display based on LED lighting with resolutions of 1280×800 (16:10) or 1366×768 (16:9) pixels and above. Models with LED-based lighting offer lesser power consumption and often increased brightness. Netbooks with a 10 inches (25 cm) or smaller screen typically use a resolution of 1024×600, while netbooks and subnotebooks with an 11.6 inches (29 cm) or 12 inches (30 cm) screen use standard notebook resolutions. Having a higher resolution display allows more items to fit onscreen at a time, improving the user's ability to multitask, although at the higher resolutions on smaller screens, the resolution may only serve to display sharper graphics and text rather than increasing the usable area. Since the introduction of the MacBook Pro with Retina display in 2012, there has been an increase in the availability of very-high-resolution (1920×1080 and higher) displays, even in relatively small systems, and in typical 15-inch screens resolutions as high as 3200×1800 are available. External displays can be connected to most laptops, and models with a Mini DisplayPort can handle up to three. On most laptops a graphical processing unit (GPU) is integrated into the CPU to conserve power and space. This was introduced by Intel with the Core i-series of mobile processors in 2010, and similar accelerated processing unit (APU) processors by AMD later that year. Prior to that, lower-end machines tended to use graphics processors integrated into the system chipset, while higher end machines had a separate graphics processor. In the past, laptops lacking a separate graphics processor were limited in their utility for gaming and professional applications involving 3D graphics, but the capabilities of CPU-integrated graphics have converged with the low-end of dedicated graphics processors in the past few years. Higher-end laptops intended for gaming or professional 3D work still come with dedicated, and in some cases even dual, graphics processors on the motherboard or as an internal expansion card. Since 2011, these almost always involve switchable graphics so that when there is no demand for the higher performance dedicated graphics processor, the more power-efficient integrated graphics processor will be used. Nvidia Optimus and AMD Hybrid Graphics are examples of this sort of system of switchable graphics. Most laptops use SO-DIMM (small outline dual in-line memory module) memory modules, as they are about half the size of desktop DIMMs. They are sometimes accessible from the bottom of the laptop for ease of upgrading, or placed in locations not intended for user replacement. Most laptops have two memory slots, although some of the lowest-end models will have only one, and some high end models (usually mobile engineering workstations and a few high-end models intended for gaming) have four slots. Most mid-range laptops are factory equipped with 4–6 GB of RAM. Netbooks are commonly equipped with only 1–2 GB of RAM and are generally only expandable to 2 GB, if at all. Laptops may have memory soldered to the motherboard to conserve space, which allows the laptop to have a thinner chassis design. Soldered memory cannot be easily upgraded. 2016-era laptops use lithium ion batteries, with some thinner models using the flatter lithium polymer technology. These two technologies have largely replaced the older nickel metal-hydride batteries. Battery life is highly variable by model and workload and can range from one hour to nearly a day. A battery's performance gradually decreases over time; substantial reduction in capacity is typically evident after one to three years of regular use, depending on the charging and discharging pattern and the design of the battery. Innovations in laptops and batteries have seen situations in which the battery can provide up to 24 hours of continued operation, assuming average power consumption levels. An example is the HP EliteBook 6930p when used with its ultra-capacity battery. A laptop's battery is charged using an external power supply which is plugged into a wall outlet. The power supply outputs a DC voltage typically in the range of 7.2—24 volts. The power supply is usually external and connected to the laptop through a DC connector cable. In most cases, it can charge the battery and power the laptop simultaneously. When the battery is fully charged, the laptop continues to run on power supplied by the external power supply, avoiding battery use. The battery charges in a shorter period of time if laptop is turned off or sleeping. The charger typically adds about 400 grams (0.88 lb) to the overall transporting weight of a laptop, although some models are substantially heavier or lighter. Most 2016-era laptops use a smart battery, a rechargeable battery pack with a built-in battery management system (BMS). The smart battery can internally measure voltage and current, and deduce charge level and SoH (State of Health) parameters, indicating the state of the cells. A common accessory for laptops is a laptop sleeve, laptop skin, or laptop case, which provides a degree of protection from scratches. Sleeves, which are distinguished by being relatively thin and flexible, are most commonly made of neoprene, with sturdier ones made of low-resilience polyurethane. Some laptop sleeves are wrapped in ballistic nylon to provide some measure of waterproofing. Bulkier and sturdier cases can be made of metal with polyurethane padding inside and may have locks for added security. Metal, padded cases also offer protection against impacts and drops. Another common accessory is a laptop cooler, a device which helps lower the internal temperature of the laptop either actively or passively. A common active method involves using electric fans to draw heat away from the laptop, while a passive method might involve propping the laptop up on some type of pad so it can receive more air flow. Some stores sell laptop pads which enable a reclining person on a bed to use a laptop. Connectivity: In the 2010s, a proliferation of Wi-Fi wireless networks and cellular broadband data services (HSDPA, EVDO and others) in many urban centers, combined with near-ubiquitous Wi-Fi support by modern laptops[note 2] meant that a laptop could now have easy Internet and local network connectivity while remaining mobile. Wi-Fi networks and laptop programs are especially widespread at university campuses. For Internet browsing and typical office applications, where the computer spends the majority of its time waiting for the next user input, even relatively low-end laptops (such as Netbooks) can be fast enough for some users. Most higher-end laptops are sufficiently powerful for high-resolution movie playback, some 3D gaming and video editing and encoding. However, laptop processors can be disadvantaged when dealing with a higher-end database, maths, engineering, financial software, virtualization, etc. This is because laptops use the mobile versions of processors to conserve power, and these lag behind desktop chips when it comes to performance. Some manufacturers work around this performance problem by using desktop CPUs for laptops. Original external components are expensive and usually proprietary and non-interchangeable; other parts are inexpensive—a power jack can cost a few dollars—but their replacement may require extensive disassembly and reassembly of the laptop by a technician. Other inexpensive but fragile parts often cannot be purchased separately from larger more expensive components. For example, the video display cable and the backlight power cable that pass through the lid hinges to connect the motherboard to the screen may eventually break from repeated opening and closing of the lid. These tiny cables usually cannot be purchased from the original manufacturer separate from the entire LCD panel, with the price of hundreds of dollars, although for popular models an aftermarket in pulled parts generally exists. The repair costs of a failed motherboard or LCD panel often exceeds the value of a used laptop. Parts can also be ordered from third party vendors. ^ Unconfirmed if this exists in most recent models of laptops. ^ Almost all laptops contain a Wi-Fi interface; broadband cellular devices are available widely as extension cards and USB devices, and also as internal cards in select models. ^ Beal, Vangie. "What is Laptop Computer? Webopedia Definition". www.webopedia.com. ^ Strickland, Jonathan. "What's the difference between notebooks, netbooks and ultra-mobile PCs?". HowStuffWorks.com. Retrieved 23 September 2014. ^ "U.S. Commercial Channel Computing Device Sales Set to End 2013 with Double-Digit Growth, According to NPD". NPD Group. Retrieved 23 September 2014. ^ Naik, Abhijit. "Notebook Vs. Laptop". Buzzle.com. Retrieved 23 September 2014. ^ John W. Maxwell (2006). "Tracing the Dynabook: A Study of Technocultural Transformations" (PDF). Archived from the original (PDF) on 24 January 2007. Retrieved 17 October 2008. ^ Alan C. Kay (1972). "A Personal Computer for Children of All Ages" (PDF). Retrieved 17 October 2008. ^ "IBM Personal Computer". IBM Inc.
^ "IBM 5100 computer". oldcomputers.net. Retrieved 6 July 2009. ^ "Epson SX-20 Promotional Brochure" (PDF). Epson America, Inc. 1987. Retrieved 2 November 2008. ^ a b c d "HC-20-Computer Museum". museum.ipsj.or.jp. ^ a b "portable computer system small". google.com. ^ "Tandy/Radio Shack model 100 portable computer". oldcomputers.net. Retrieved 6 July 2009. ^ "Hewlett-Packard model 85". oldcomputers.net. Retrieved 6 July 2009. ^ "Gavilian SC computer". oldcomputers.net. Retrieved 7 July 2009. ^ "Milestones:Toshiba T1100, a Pioneering Contribution to the Development of Laptop PC, 1985 - Engineering and Technology History Wiki". ethw.org. ^ "Linus Write-Top". Retrieved 18 October 2008. ^ a b "Types of Laptops: How Do You Compute". PC Magazine. Ziff Davis Publishing Holdings Inc. 18 September 2006. Retrieved 7 November 2008. ^ "Breaking the Mold: New Lenovo ThinkPad laptop and Tablet PCs Defy Ultraportable Computing". Lenovo. 23 September 2008. Archived from the original on 6 November 2008. Retrieved 7 November 2008. ^ Focus, Global; America, North. "The Net Impact of Netbooks? It Depends on Who Uses Them for What". Knowledge@Wharton. ^ Bergevin, Paul (3 March 2008). "Thoughts on Netbooks". Intel.com. ^ Netbook Trends and Solid-State Technology Forecast (PDF). pricegrabber.com. p. 7. Archived from the original (PDF) on 26 February 2009. Retrieved 28 January 2009. ^ Arthur, Charles (31 December 2012). "Sayonara, netbooks: Asus (and the rest) won't make any more in 2013" – via www.theguardian.com. ^ a b "Laptop Buying Guide". CBS Interactive Inc. Retrieved 7 November 2008. ^ "Desktop notebooks stake their claim". CBS Interactive Inc. 8 January 2003. Retrieved 7 November 2008. ^ "Rugged Laptop: Choices, Pointers & Specs of Buying Rugged Laptops". Linux-on-laptops.com. Retrieved 27 November 2008. ^ Dé specialist voor smartphone, tablet en laptop reparaties (4 January 2013). "Laptop reparatie". Smartrepair Den Bosch, Nijmegen, Tilburg, Almere en Utrecht (in Dutch). www.smart-repair.nl. Retrieved 30 March 2017. ^ "Microsoft Surface Pro 3 Teardown". iFixit.com. Retrieved 1 October 2014. ^ "Common Building Blocks Platform," (PDF). Intel. Archived from the original (PDF) on 16 May 2006. Retrieved 20 November 2013. ^ a b Catherine Roseberry. "What Makes Laptops Work – The Laptop Motherboard". About.com. Retrieved 15 November 2008. ^ a b "Configuration 3-Displays FAQ". Intel.com. Retrieved 16 September 2014. ^ Edwards, Benj (17 January 2012). "Evolution of the Solid-State Drive". PCWorld.com. Retrieved 1 October 2014. ^ BeHardware reported lower retailer return rates for SSDs than HDDs between April and October 2010. Prieur, Marc (6 May 2011). "Components returns rates". BeHardware. Archived from the original on 14 February 2012. Retrieved 10 February 2012. ^ A 2011 study by Intel on the use of 45,000 SSDs reported an annualized failure rate of 0.61% for SSDs, compared with 4.85% for HDDs. "Validating the Reliability of Intel® Solid-State Drives". Intel. July 2011. Retrieved 10 February 2012. ^ Prieur, Marc (16 November 2012). "Components returns rates (7)". BeHardware. Archived from the original on 9 August 2013. Retrieved 25 August 2013. ^ "Samsung 16TB SSD is the World's Largest Hard Drive". PetaPixel. Retrieved 20 September 2015. ^ "MacBook Pro 15" Retina Display Late 2013 Teardown". IFixit.com. Retrieved 1 October 2014. ^ Most keyboards are not illuminated. Some models of laptop feature an illuminated keyboard. ^ "Apple — MacBook — Tech Specs". apple.com. Retrieved 2 April 2015. ^ "Chromebook Pixel". google.com. Retrieved 2 April 2015. ^ Gabriel Torres (25 November 2004). "Innovations in Notebook Expansion". Hardware Secrets, LLC. Archived from the original on 28 April 2005. Retrieved 15 November 2008. ^ "HP EliteBook 6930p Notebook PC specifications – HP Products and Services Products". H10010.www1.hp.com. 25 May 2009. Archived from the original on 1 June 2012. Retrieved 17 June 2013. ^ a b Woods, Dough. "Getting rid of the ICT suite". Blog. Archived from the original on 6 October 2010. ^ Wilce, Hilary (1 December 2000). "Welcome to Lapland". TES Magazine. Archived from the original on 26 May 2015. Retrieved 5 June 2012. ^ Clarke, Gavin. "The SOLAR-POWERED Ubuntu laptop". THE REGISTER. Retrieved 7 August 2013. ^ "OLPC XO laptop powered by a solar panel". YouTube. 9 January 2012. Retrieved 23 October 2012. ^ Elizabeth Woyke (18 April 2012). "A Look at OLPC's XO 3.0 Tablet's Solar And Kinetic Chargers". Forbes. Retrieved 23 October 2012. ^ "One Laptop per Child (OLPC): Frequently Asked Questions". Laptop.org. Retrieved 23 October 2012. ^ "Samsung's Solar Powered Laptop Will Be First Sun Powered Laptop Sold in US | Inhabitat – Sustainable Design Innovation, Eco Architecture, Green Building". Inhabitat. Retrieved 23 October 2012. ^ "Should I buy a laptop or desktop?". IT Division – University of Wisconsin. 19 March 2008. Retrieved 27 November 2008. ^ Josh Fischman (7 August 2008). "Faster Wi-Fi Predicted for Colleges". The Chronicle of Higher Education. Retrieved 27 November 2008. ^ A sample line of UPS devices and on-battery power: "Back-UPS RS". APC. Retrieved 27 November 2008. ^ In a comparison between laptop and desktop of equal cost, the desktop's System Benchmark Score was twice that of the laptop. "What to Buy, a Notebook or Desktop PC?". Tom's Hardware. 11 June 2008. Retrieved 28 November 2008. ^ For example, a review of the MSI Wind Netbook says that "The device is rarely sluggish in general use. It renders Web pages quickly, launches most applications without becoming too bogged down and generally doesn't feel like it's a budget laptop." Reid, Rory (7 July 2008). "MSI Wind Review". CNET Australia. Archived from the original on 5 December 2008. Retrieved 28 November 2008. ^ "Rock delivers BD / Core i7-equipped Xtreme 790 and Xtreme 840 gaming laptops". Engadget. ^ Toub, Allegra (23 May 2017). "Take It Easy on Those Keyboards". Backlight Resumes. Retrieved 23 May 2017. ^ Yin, Sara (8 November 2010). "Study: Laptop Pads Don't Prevent Male Infertility". PC Magazine. Retrieved 8 November 2010. ^ "Men, your laptop may be roasting your testicles". The Independent. 8 November 2010. Retrieved 8 November 2010. ^ Caulfield, Philip (7 November 2010). "Study finds men who place laptop computer on lap put testicles at risk of overheating, infertility". Daily News. Retrieved 8 November 2010. ^ Joelving, Frederik (8 November 2010). "Is your laptop cooking your testicles?". Reuters. Retrieved 8 November 2010. ^ Levinbook, WS. ; Mallet J; Grant-Kels JM (October 2007). "Laptop computer—associated erythema ab igne". Cutis. Quadrant HealthCom. 80 (4): 319–20. PMID 18038695. ^ Diaz, Jesus (7 October 2010). "What Is Toasted Skin Syndrome?". Gizmodo. Retrieved 8 November 2010. ^ Hendrick, Bill (4 October 2010). "Laptop Risk: 'Toasted Skin Syndrome'". WebMD. Retrieved 8 November 2010. ^ Tanner, Lindsey (10 April 2010). "Laptops lead to 'toasted skin syndrome'". Associated Press. Retrieved 8 November 2010. ^ "Gartner: Notebook PCs still prone to hardware failure". IDG News Service / ITWorld. 27 June 2006. Retrieved 27 November 2008. ^ Geier, Eric. "Zen and the Art of Laptop Maintenance". PC World. Retrieved 25 January 2014. ^ "Secure File Sharing". Biometric Devices and Laptop Security. Laptop Security Pro. Retrieved 7 February 2015. ^ Hoffman, Chris. "How to Secure Your Computer With a BIOS or UEFI Password". How-To Geek. ^ Hoffman, Chris. "Hard Disk Passwords Explained: Should You Set One to Secure Your Files?". How-To Geek. ^ Holmes, Kristin E. (31 August 2010). "Lower Merion School District ordered to pay plaintiff's lawyer $260,000". The Philadelphia Inquirer. Retrieved 20 September 2010. ^ "Main Line Media News". Main Line Media News. 18 September 2010. Retrieved 20 September 2010. ^ "Identical Laptops, Different Prices: Don't Be Fooled by Branding". Info-Tech Research Group. 10 October 2006. Retrieved 11 November 2011. (Registration required (help)). ^ "Lap-top computers gain stature as power grows". Daily News of Los Angeles (CA). 12 April 1987. Retrieved 1 November 2008. ^ a b "The Falling Costs of Mobile Computing". Falling Costs of Mobile Computing Drive Corporate Adoption. Computer Economics, Inc. December 2005. Retrieved 1 November 2008. ^ Randall Stross (18 April 2008). "The PC Doesn't Have to Be an Anchor". The New York Times. Retrieved 20 April 2009. ^ Michael Singer. "PC milestone—notebooks outsell desktops". 2005. ^ "Netbooks Are Destroying the Laptop Market and Microsoft Needs to Act Now". eWEEK. ^ Recycling, Newtech. "Laptop Disposal Ewaste Recycling and IT asset disposition (ITAD)". www.newtechrecycling.com. Retrieved 2018-06-11. ^ "Macintosh Portable: Used in Space Shuttle". Support.apple.com. Retrieved 23 October 2012. ^ Linzmayer, Owen W. (2004). Apple confidential 2.0 : the definitive history of the world's most colorful company ([Rev. 2. ed.]. ed.). San Francisco, Calif.: No Starch Press. ISBN 1-59327-010-0. ^ "This Week in Apple History – August 22–31: "Welcome, IBM. Seriously", Too Late to License". The Mac Observer. 31 October 2004. Retrieved 23 October 2012. ^ "2001: A Space Laptop - SpaceRef - Your Space Reference". www.spaceref.com.